Our pre-mission plan was simple enough – go up, come down, run around. 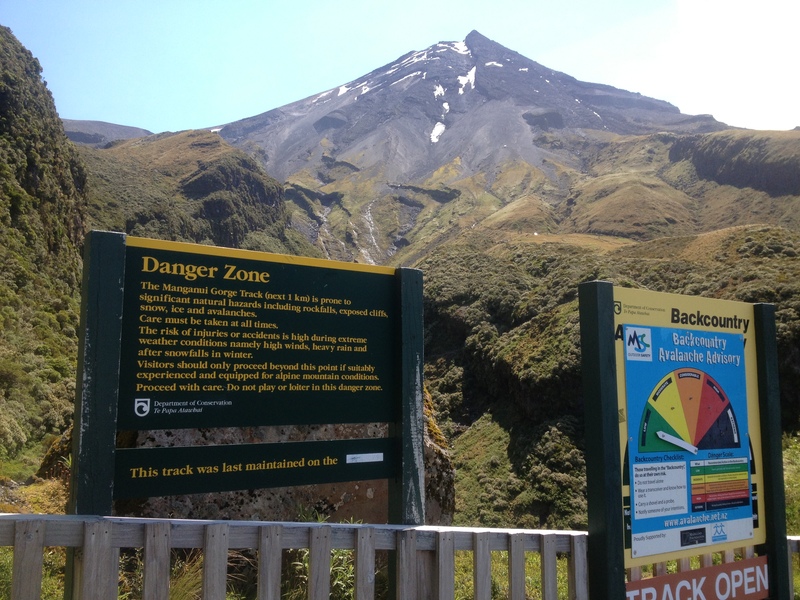 The ‘up’ being an ascent of the North Island’s second-highest peak, Taranaki; the ‘down’, well hopefully that’s obvious; the ‘around’ being a full circumnavigation of the mountain on the legendary Round The Mountain Circuit. To the best of our knowledge, and that of Alistair McAlpine who runs the Taranaki Speed Records site, this had never before been achieved in a single outing. 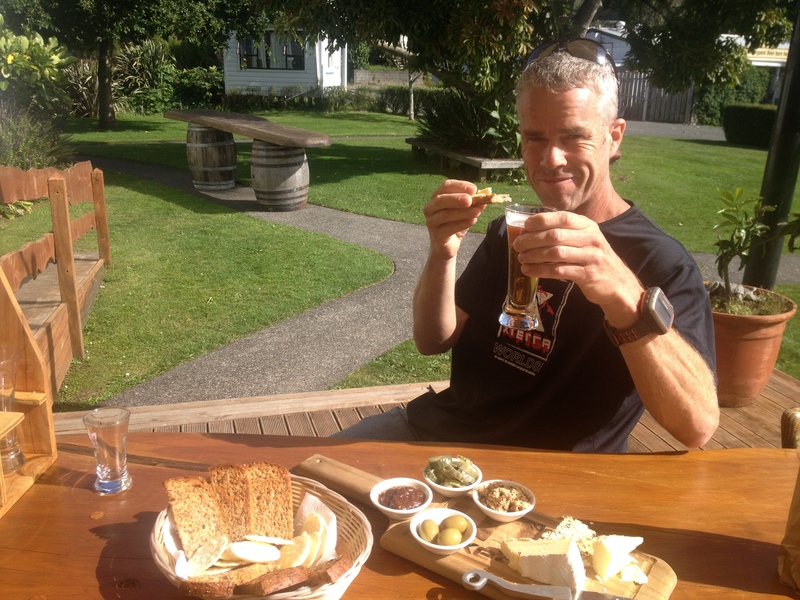 My companion for the task couldn’t have been better qualified or prepared – fresh from the first Solo Unsupported Double Hillary Trail a couple of weeks earlier, Steve Neary’s toes were almost repaired and he was gagging to go. 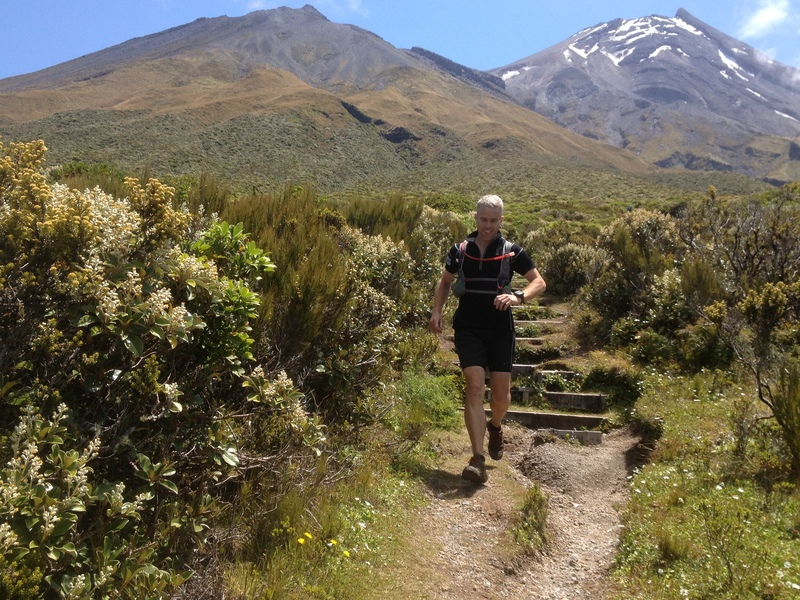 I knew we’d work well together as a team as we’d done some big missions together before, most notably a similar Up, Down & Around on Ruapehu last April. 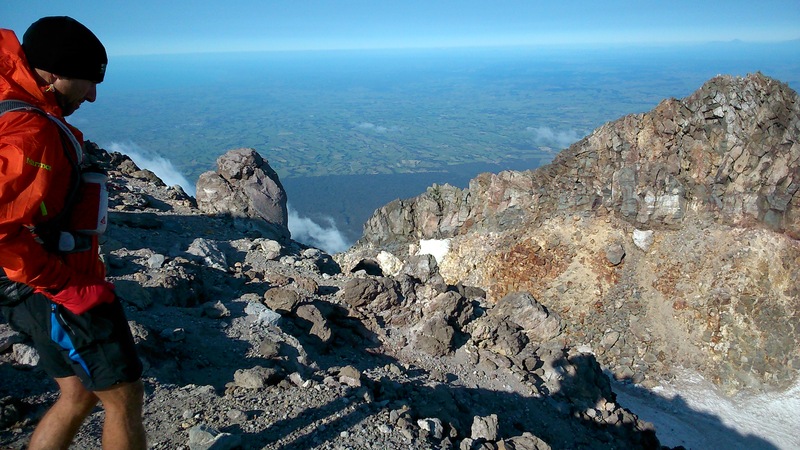 That one had taken us just a few minutes shy of 24 hours to complete; we were hoping that the Taranaki outing would be some 8 or 9 hours shorter. But so much for our simple plan. Looking at the mountain forecast the night before while we chowed into a big bowl of pasta and quaffed a nice bottle of Kennedy Point Syrah, we were a little worried by the prospect of 100kph+ winds on the summit the next morning. 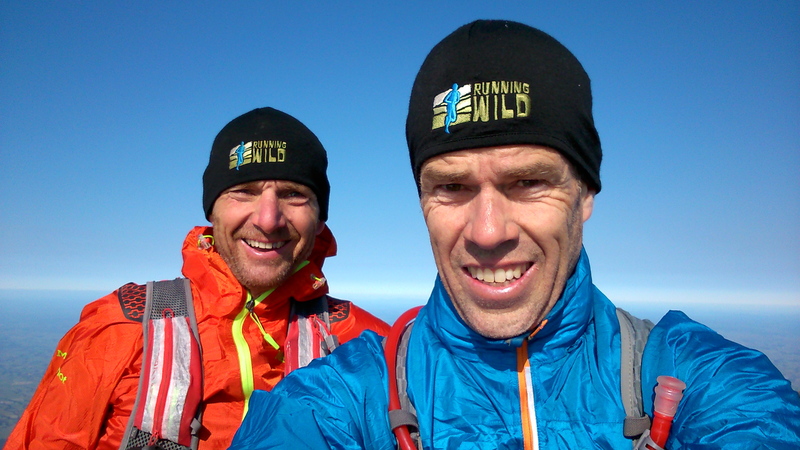 A backup plan was hatched – we’d check the forecast again when we rose at 3am and if the wind was still predicted to be anything more than 50kph on the summit we’d start by running around the mountain first. Of course this would mean tackling the steep 1,000m ascent on trashed legs, but that would be preferable to being blown off the top. Too soon the alarm roused us from slumber. While the porridge cooked we checked the forecast again – still predicting 80kph+ summit winds at 6 a.m. but easing as the day wore on. There was no doubt about it, Plan B was the way to go. A couple of hours in, the soft glow that we’d been watching on the eastern horizon started to claw its way across the sky in front of us, heralding a beautiful dawn. Straight ahead the Pouakai Range was silhouetted dramatically, while above an almost full moon completed a picture of such perfection that we were left with no choice but to stop and snap a series of photos that failed dismally to do justice to this treat of nature. Descending a long series of steps we reached Holly Hut and took a couple of minutes to scoff some food and top up our water supplies. So far the track had been reasonable underfoot, but all that was about to change. Heading downhill on Bells Falls Track things started getting rooty and technical – a foretaste of the next many hours. Climbing out of Stony River! Another hour or so on we reached the appropriately named Stony River and followed it downstream, crossing a number of dramatic side creeks that afforded us great views to the summit, alarmingly far away to the southeast of us. 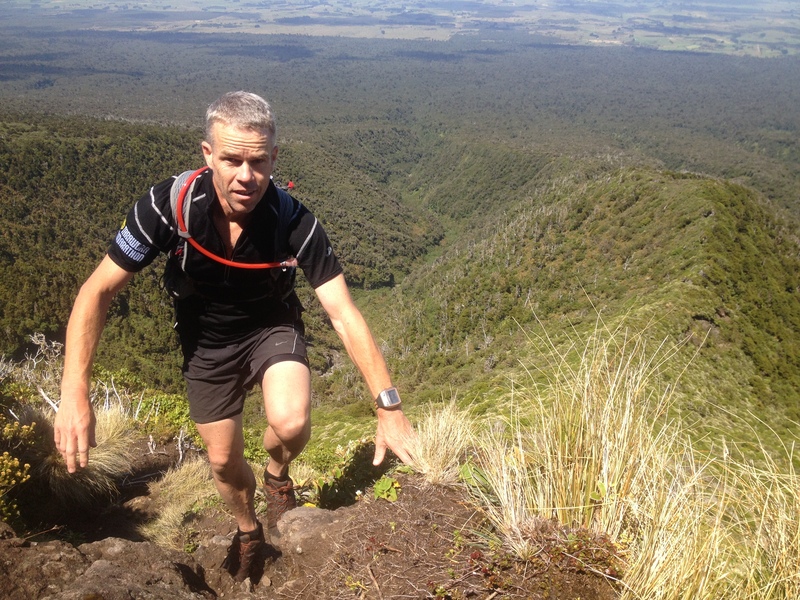 But soon enough it was time to start climbing again – a steady 400m ascent to Kahui Hut where we stopped briefly to chat with a DOC goat hunter. Descending again on rough bush track we reached the Oaonui Track and followed the contours of the mountain through bogs and windfall, making no more than about 4 kms per hour progress. But hey, we were in no particular rush, and apart from nearly knocking myself out on one unforeseen tree branch, it was smiles all the way. We eventually reached the spectacularly located Waiaua Gorge Hut and took another fuel break before descending into the ‘pit of doom’ via one of the scariest, most vertical (I swear it was actually overhanging!) ladders that I’ve ever set foot on. We were now on the exact opposite side of the mountain from where we’d started but had dropped down well below the original elevation. 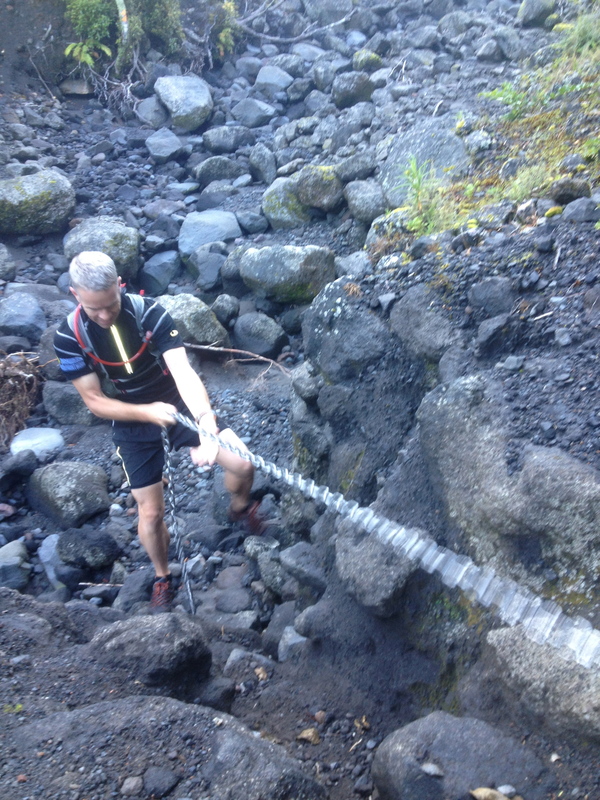 It was time to take on the monstrous climb of the Brames Falls Track – a steady but unbroken ascent of some 750m that took us over an hour to knock off. But our efforts were rewarded with views of the spectacular bluffs that we know had to sidle beneath to reach the open country beyond. Still climbing we reached one of the highest points of the Circuit (over 1,500m) and considered a revised assault on the mountain via a southern approach instead. The ridge leading to the top looked incredibly tempting but a shortage of water, and no prospect of finding any en route, eventually settled matters and we continued on with Plan A.
Travelling through the open tussock country high on the southern flanks of the mountain, crossing the numerous dry gullies that spill across it, was a real highlight and we rejoiced in views far and wide, not least being our first glimpse of the Dawson Falls Visitor Centre, a depressingly long way beneath us. 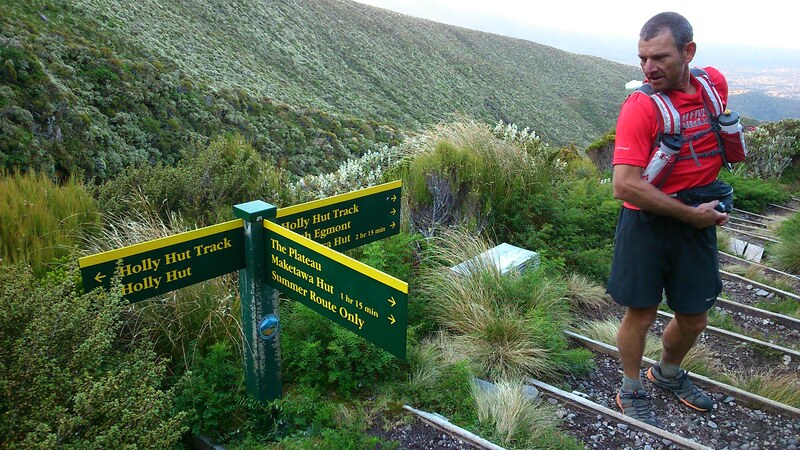 To reach this we had to take on the steep descent of Fanthams Peak track, at first on well-made boardwalks and then on an increasingly eroded series of steps that had been specifically designed to catch the toe of the tired trail runner. For the first time all day Steve was feeling the effects of his Double Hillary mission, his not-yet-fully-repaired toes taking a real hammering. We reached the Visitor Centre after some 9 hours on the trail and figured we’d earned some salty chips and a bottle of cold Powerade each. Thankfully Steve had remembered to pack some cash and so our dreams came true. After a short break we picked our way through the slightly confusing maze of trails on this SE corner of the mountain and found ourselves at The Plateau. 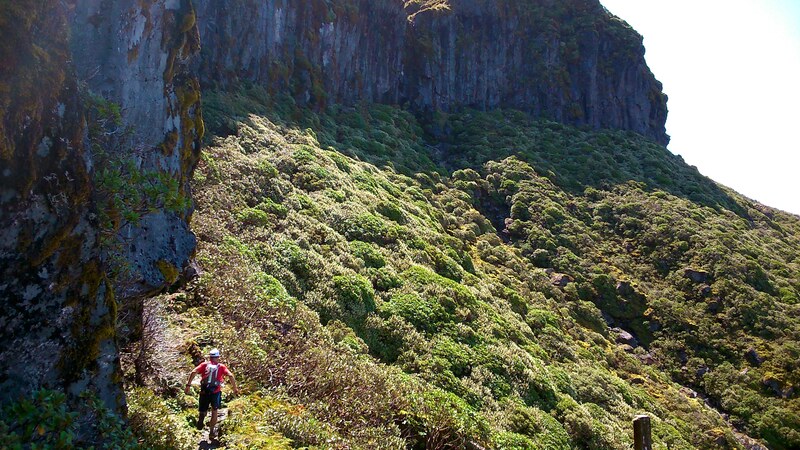 A short way beyond we hit the spectacular Manganui Gorge Track and the bottom of the ski field. Now moving in a northerly direction, climbing steadily all the time, we were getting close to the base of the northern summit route. We were tired and thirsty and very grateful to the member of the private Tahurangi Lodge who allowed us access to their kitchen and its precious supply of drinking water. We drew a deep breath, craned our necks skyward and took in the view of the summit towering above us. A steady stream of people were descending the boulder field that forms the base of the route but we, now almost 12 hours into our day, had to muster the energy to move past them in the opposite direction. At first it wasn’t too bad. Beyond the boulders lay a long series of boardwalked steps – plod, plod, plod – tiring but manageable. However, beyond this was the ‘2 steps forward 1 step backwards’ seemingly endless loose scree slope that Steve ate for afternoon tea, but which totally did me in. Feeling pretty desperate and nauseous in the late afternoon warmth, I struggled badly for the next hour. Not even the unlikely sight of a German tourist descending the mountain in bare feet – “because that’s how hobbits do it!” – could cheer me up. But nearing the summit crater the scree gave way to boulders and the bitter wind that was blowing a gale swept away the heat that had been afflicting me. All of a sudden, with a sniff of the summit I was feeling better and charged for the top. Across the snow-filled crater (alas not icy enough to warrant the micro-spike crampons that we’d been carrying all day) and up one final rocky slope, we burst on to the summit, buffeted by freezing winds blowing some 60kph, and grinned broadly. We’d made it! 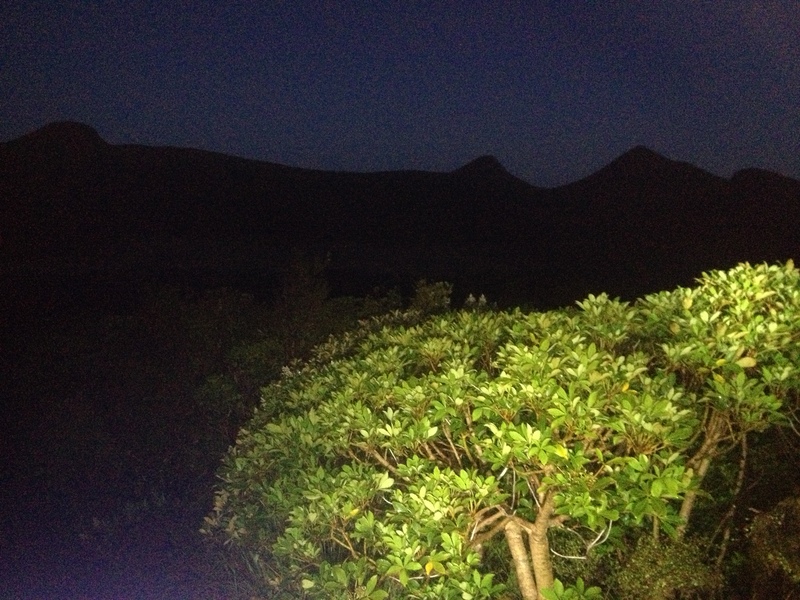 Now, after 14 hours on our feet we had to head back down to the car, some 1,500m below us. The descent was tricky, the scree not deep enough to make for good running, and our arses took a battering, but it sure beat climbing up it! 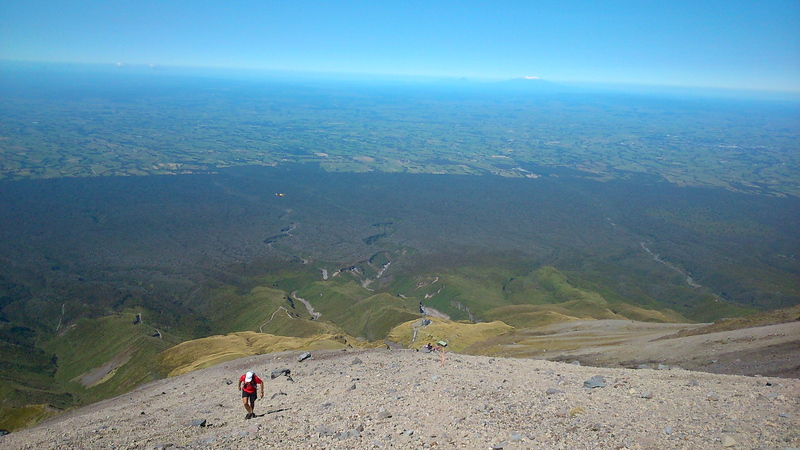 Just before we reached the stairs again we stopped and marveled at the shadow of the mountain stretching far out to the east, pointing like a long fat finger towards Ruapehu far off in the distance – what a sight for sore feet! Reaching Tahurangi Lodge again we had to ignore the easy way down The Puffer and instead close the loop on the Circuit (a couple of kms of rough, rocky trail) before descending back down the way we’d started well over half a day before. The final few kms seemed endless, as though some malevolent force had stretched the trail while we’d been away, but eventually we were there, back at the Camp House, 16 hrs and 19 minutes after setting out. Big man hugs, jubilant calls to our loved ones and a big feed of fish & chips, washed down with a couple of fine ales, completed the epic day out. In two words – Bloody Brilliant! 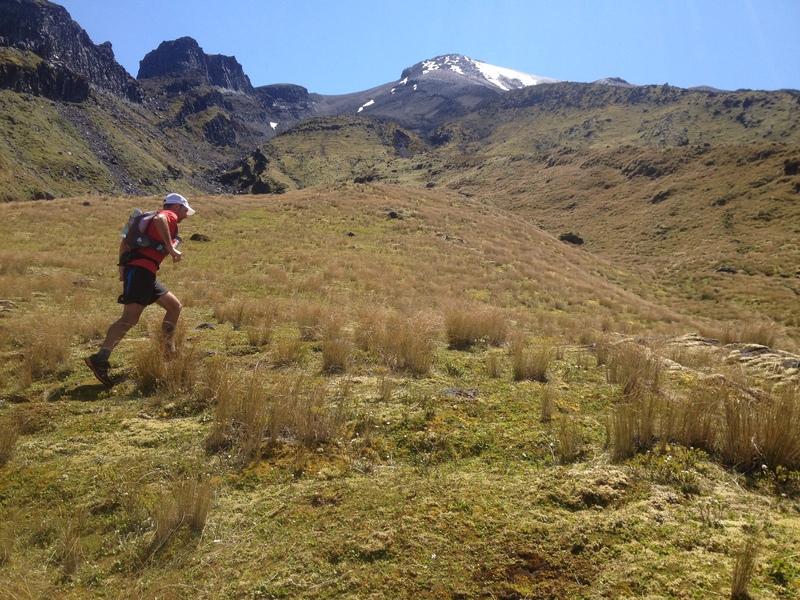 This entry was posted in Great runs and tagged Fastest Known Times, Taranaki, trail running, ultra running. Bookmark the permalink. Sounds like an awesome adventure! Reading your account is nearly (but not quite) as much fun as doing it myself. The trip report that got me dreaming big and still one of my favourite adventures. You and Steve epitomise what we’re here for. He may no longer be treading the paths before me but his spirit is what still drives me. Choice one guys.